In a world in which humans write thousands of books and one million scientific papers a year, the mythic bricoleur is the person who plays with all that information and hears a music inside the noise. Books are strange animals, and great books are stranger still. For me, one attribute of a great book is that it changes my views of the world. These books also possess specific qualities of image and intellect supported by an architecture of fine craft, creating an experience that is holistic—an experience in which it appears that nothing has been overlooked. This experience occurs repeatedly for me with each viewing of a book by Ian Boyden. For decades now I have looked at fine books and bindings by many of the world's most facile craft workers. I am often dazzled by the skills that each bookbinder brings to his or her process, which follows conception, design, papermaking, and usually printing. Bookbinding, in its conventional means of working, is a series of steps leading to a final assembly. The bookbinder is the last artisan in the art of the sequence. In the books of Ian Boyden, a different music is attended to and something unusual occurs. Boyden's ease straddling the worlds of idea and craft has an amphibian-like duality. As with the amphibian, both of his operant conditions are simultaneously “on.” He is both the conceiver and the builder of the entire book, either as a solo project or one of collaboration. His books grow out of a symbiosis of idea and structure—cold fusion. I am drawn to a particular aspect of Boyden's books and paintings: they are grounded not so much in memory as they are in occurrence. His creative process, especially with the inky black books and paintings, springs from a fertile imagination whereby the work appears spontaneous, without apparent labored preconception, displaying instead a basis in experiences and dances that yields an elegant surface and a formidable message. It is the kind of work I enjoy the most—where method is invisible and idea is compelling. The mythologist Joseph Campbell once remarked that art can come from many motivations, but that high art comes only from high mind. If one makes a book strictly to sell, or if the process of making a book is done with divided attention, the outcome is a commodity or merely a minor work. But if one works as Boyden does, with a goal of getting the self out of the way and allowing transcendent forms, ideas, and patterns to develop, an authentic art results that is vivid and present. This is art that breaks through to radiance. I have before me Peach Blossom Fish: Selected Poems Composed and Calligraphed by Chang Ch'ung-ho. This book was made in 1999 in an edition of 140 copies. It is elegant. Not small, it can nonetheless be held in the hands for viewing, but it is best displayed on a cushioned surface so some distance can be gained. The spine is black and ochre, foil-stamped in silver. The wooden boards fit perfectly and are made of padauk wood. Into the front board is engraved a seal, very elegant, which is picked up on the title and half-title pages. The type is set in Gill Sans, my favorite typeface and one that I consider to be sacred in the manner of its geometry and design. This book is built as a traditional sewn binding. The board attachment is novel and moves perfectly to allow access to the book. Peach Blossom Fish is a fully articulated work, integrated and in a subtle way breathtaking. I have just opened the book to a favorite spread, “A Painting of Two Fish,” and found an eyelash of mine that must have fallen during a previous read; it caught my eye just as I read the line “To fathom the boundless meaning beneath our floating tracks.” This is a beautiful page spread, with a generous amount of white space in which the lines seem to float. Boyden has a keen sense for how to place things on a page, as this book demonstrates. My breath is inspired as I myself float over this work. Though Peach Blossom Fish is not a gigantic book, it unfolds enormously. It is the first published collection of poems and calligraphy by Chang Ch'ung-ho—a subject rare enough in America, but rarer still is the book's modest scale. In this way, Boyden brings to the project an artisan handling of materials and design that lies totally beyond the capacity of the commercial book production world. I am moved not only by this book's gentle projections of dreams and memory and “our floating tracks,” but also by the physical container—I am always one to first judge a book by its cover, as for me the term “cover” alludes to the entire physical object. Physicality of material and the qualities suggested by material are never far from Boyden's mind. I have gone on many walks with him, and it seems that as we walk he reads to me from the text of the earth. It is like hiking with a naturalist: as he points out insects and plants, he reveals things in a language that is not mine—he is articulate and I am a novice and so I learn. Boyden reads equally well texts from the stars—texts that were etched into material during an event at the beginning of deep time. In Sidereal Heart we see his vivisection of a meteorite, a fragment of a star, a condensed substance that has undergone extraordinary stresses to become a new material, a new information delivery system. He has sliced and sectioned it—as one might do with a fallen tree to determine its age and some of its story—and in the process he has revealed a writing, a text and texture, that tells a tale. It is a narrative that is more than four billion years old. Sidereal Heart is a translation that, through Boyden's transformative hands and inner gaze, has become an artifact of great age and dimension. In the best sense of modern bookbinding, he has rebound the meteoritic leaves with new techniques to create the oldest book on the planet. It is a staggering accomplishment. The dynamic action of how the book's binding operates plays a critical role. The elaborate yet simple stainless-steel structure that binds the leaves of the meteorite brings the book into alignment with our current level of technology. This book would not have worked using string and cloth as a covering or binding material. It demands that the wings and sections be formed in such a manner as to pay homage to the rarity and extraordinary presence of the meteoritic planes. For me, the mechanical forms that hold the segments are like the old hands of a venerable scribe or teacher, pointing us toward the means to look far beyond what we normally see in a book and what we often take for granted. No book on astronomy does this as well as Sidereal Heart. Metaphorically speaking, the “hands” holding the leaves might belong to another of Boyden's calligraphy teachers, revealing to him a new mark, teaching him to read anew. Just as we cannot step outside ourselves to look in, we cannot step outside our universe to see it from a distance and take its measure. We are embedded in this place of our “being.” And though we regularly view our place in the solar system as unique and almost Copernican in location—in the middle of everything—we nonetheless see ourselves as separate from outer space. 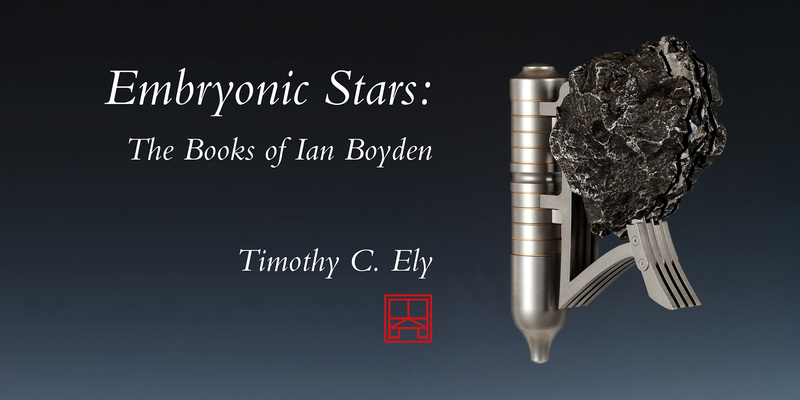 Boyden's meteorite books offer a new direction out of this isolation; he does this by extending his reach for a narrative material beyond the atmosphere and the orbit of the moon. Sidereal Heart in turn extends our reach and our ideas about where we stand in the larger whole. It teaches us that we are embedded in the universe, not separate from it. I imagine that Galileo would have treasured the chance to sit with this book. The contrast between Peach Blossom Fish and Sidereal Heart is delicious. Peach Blossom Fish reads and feels gentle, like a breeze carrying the smell of the sea. It is made of beautiful paper, carefully sewn, printed, and bound in wood with all the balances conceived and made by a masterful touch. Sidereal Heart, by contrast, is powerful—an engine of sign and signal, a transmitter. 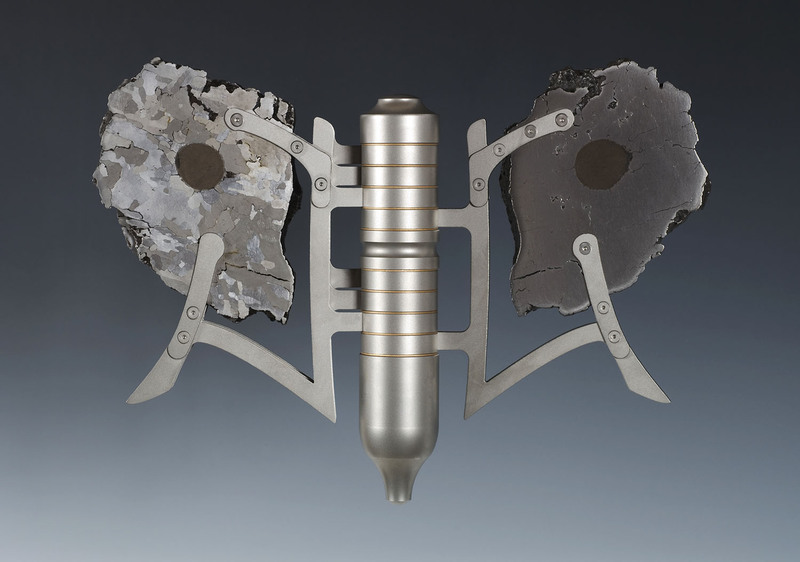 It is iron and nickel and machined and polished and it challenges long-held notions of what is capable of delivering a text. It does this precisely if one is still and looks intently at the book, if one feels this book with one's eyes. Boyden's books, though deeply expressive of his personal ideas and interests, are never really about the artist himself. Rather, they are about directions that transcend the self. These ideas, whether worked out solo or molded into shape in collaboration with scribes, poets, and visual artists, speak to courses of action of a greater magnitude. These interests are like fulcrums to form, and each book that rises from the mind and hands of Ian Boyden is a complete communication. In all their diversity, these books, like the strange animals that all great books can be, are intelligent and perceptive. We have in front of us a unique and singular vision.